Providing superior aeration, our premium wine aerators can help soften tannins and remove sediments - helping your bottle of Cabernet Sauvignon, Pinot Noir, and/or Merlot reach its full flavor potential. The HiCoup Wine Decanter's contemporary, elegant and graceful clear glass shape will complement your stemware, look fancy and beautiful on your table, and is sure to delight the aficionado. Its freeform shape provides a generous surface area for aeration, while the narrow mouth ensures drip-free serving. Starting with a bubble of molten glass, an accomplished glassblower creates a long tube, then manipulates it to give this traditional decanter its organic shape. 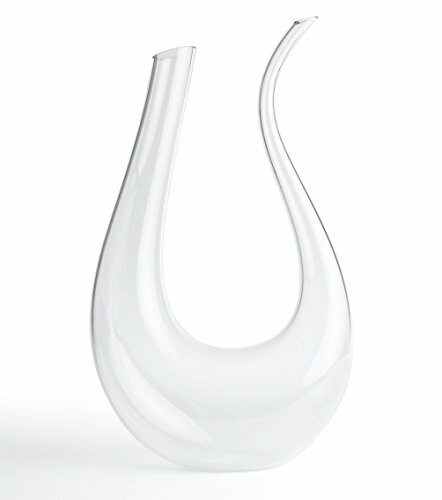 Crafted entirely by hand, each individual u-shaped carafe is a personal and unique work of art. However, this scintillating creation is also supremely useful. A HiCoup Wine Decanter, when used correctly, can greatly improve your wine drinking experience through aeration and precipitation of sediment. All HiCoup products come with a Lifetime Warranty and a 100% Customer Satisfaction Guarantee. With a totally "risk-free" purchase, it's a no-brainer to give this product a good try. So don't hesitate ... scroll to the top of this page and click "Add to Cart" now! SLEEK MODERN DESIGN - This delightful wine decanter will not only allow you to serve your favourite red or white bottles of wine at an optimum level, it will allow you to serve it in a modern and fashionable way. Sleekly styled, each one of these artisan made, mouth blown and lead free crystal glass decanter has its own unique charm. The elegant and beautifully crafted Horn Wine Decanter will be a graceful addition to your barware, bringing a touch of drama and sophistication to any gathering. GREAT FOR ALL OCCASIONS - Most wines don't need decanting, but they often benefit from aeration. Our swan shaped decanter improve the flavor of wine and prevents you from getting a mouthful of stem, seed, and pulp sediment. Our stylish pourer / aerator is great for any occasion - used as a decorative pitcher filled with orange juice for Sunday morning brunch or on a guest's nightstand filled with water. Fine wine or water, there's reason enough to buy your very own top rated luxury decanter. DESIGNED FOR MAXIMUM AERATION AND DRIP-FREE POURING - Shaped like a Lyre, our decanter is not only pretty, but it is also easy to use. Pour your basic 750ml bottle of wine into the decanter through the larger opening where it is then given time to aerate prior to being poured from the small spout and into a glass. Our decanters are light, well balanced, easy to grasp, and the thin pouring lip also allows for drip-free pouring. And our wine dispenser is dishwasher safe and simple to clean! THE PERFECT GIFT - Whether you are shopping for Christmas, Birthday, Father's Day, Wedding or any other special occasion, the HiCoup decanter makes the perfect gift! Your wine-loving gift recipient will know that aeration and oxygenation are an important part of experiencing the full flavours and aromas in a wine. By gifting our red wine carafes, you just helped to make their bottle of wine that much more enjoyable. A HIGH-QUALITY PRODUCT BACKED BY THE BEST CUSTOMER SERVICE - We'll let our seller feedback speak for themselves. We are so confident in the quality and durability of our products that we stand behind them 100% with a FREE LIFETIME WARRANTY. If something breaks or if you don't absolutely love your new red wine decanter we will OFFER A REPLACEMENT and/or REFUND YOUR MONEY, no questions asked. If you have any questions about this product by HiCoup Kitchenware, contact us by completing and submitting the form below. If you are looking for a specif part number, please include it with your message.